Leaderboards, StreetPass support and downloadable ghosts should make this highly anticipated title even sweeter. Over the years, Nintendo has absorbed plenty of criticism in regards to online play, or a disappointing lack thereof. Apparently, the big N listened. From what we can tell, Mario Kart 7 (releasing on 3DS December 4) will be the most fully featured online game the company's produced. It starts with online multiplayer, which we've known about for some time. Taking this a step further, the new Community feature lets players create groups and custom racing rules. They can then share this information via StreetPass. In addition, gamers will have up to date leaderboards that display info from recent races. Meanwhile, walking past another Mario Kart 7 player results in an exchange of data, be it racing scores, win/loss records, number of collected coins, etc. On top of that, through SpotPass, users can download up to seven ghosts to compete against, allowing for an eight player race. Finally, a centralized Mario Kart channel lets gamers view info collected via SteetPass and SpotPass. 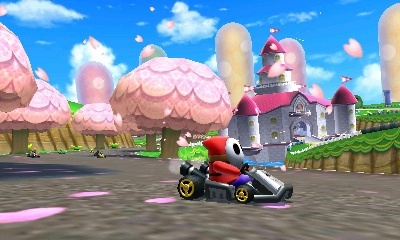 In other words, all the more reason to buy Mario Kart 7.